Toohill is interested in organizational development and games—both in using games in the workplace and in bringing better organizational development practices to work to the game industry. She heard about Buffalo through a story produced by the NPR Code Switch team and sought out a practicum with Tiltfactor Laboratory, a game research center led by Dr. Mary Flanagan and located at Dartmouth College in Hanover, New Hampshire, to complete the workbook. Buffalo, which was first introduced in 2012, was created as part of a National Science Foundation-funded project to combat bias in science fields. The game is designed to “foster a sense of open mindedness through play,” and has been shown to decrease players’ prejudices in randomized trials. The game was intentionally developed and released as a party game with no explanation about how playing it can lead to reduction in implicit bias (the attitudes or stereotypes that affect our understanding, actions, and decisions in an unconscious manner). “It’s less effective if people begin playing the game knowing that it’s being played to reduce bias,” Toohill said, but that’s exactly what the game can do by subtly challenging players to think beyond stereotypes to come up with answers. The workbook combines scientific explanations with informed discussion questions to teach participants about implicit bias and reactance (a pattern of behaviors that occur when an individual feels their freedoms are being taken away or restricted). It also illustrates ways in which playing games can increase the ability to think systematically. Facilitators can use the game as an icebreaker, without informing groups of the purpose, then bring the workbook in during debriefing and processing activities. 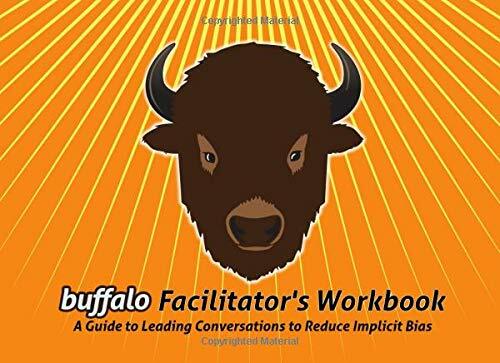 The Buffalo Facilitator’s Workbook expands Buffalo: The Name Dropping Game to turn training sessions into “engaging, exciting, hands-on learning opportunities,” balancing information rooted in science and psychology with discussion and reflection questions for individuals and groups. The workbook is now available on Amazon. Tiltfactor Laboratory, a leading research and design studio based at Dartmouth College, is dedicated to understanding how games can be used to generate new knowledge. Tiltfactor designs, studies, and launches games, across a variety of platforms, that use core psychological principles and strategies to promote learning and impact players’ thoughts, feelings, and behaviors. Founded and led by Dr. Mary Flanagan, Tiltfactor uses its unique design methodology, Critical Play, to incorporate fundamental human values and psychological principles to promote pro-social values such as cooperation, perspective taking, empathy, and civic engagement. Follow the lab @tiltfactor on Twitter. Founded in 1974, William James College is an independent, not-for-profit institution and a leader in educating the next generation of mental health professionals to support the growing and diverse needs of the mental health workforce. Integrating field work with academics, the College prepares students for careers as organizational leaders and behavioral health professionals who are committed to helping the underserved, multicultural populations, children and families, and veterans. William James College alumni can be found making an impact in a variety of settings, including schools, the courts, clinical care facilities, hospitals, the community and the workplace.